Some exciting news for all my fans out there … I am featured in the new book, The 100 Top Psychics & Astrologers in America 2014. This is my second time being featured in this book. 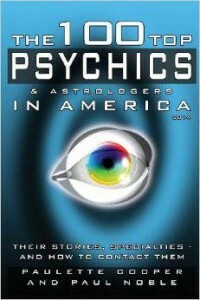 I have a 3-page interview included in the book detailing my life as a Psychic Medium (as well as Certified Tarot Grand Master, Astrologer, Numerologist, and more). It is a real honor to be recognized as one of the top people in such an amazing field. The book was written by Paulette Cooper and Paul Noble. Paulette has published over 20 best-selling books. I also designed the official website for the book, as well and also put together all of the pages for our Social Media presence. You can buy a copy, personally signed by me by emailing a request, via my email address listed on the front page of this site. I accept payments via PayPal. I will be promoting the book — so let me know of any bookstores in your area that you would like to see sell the book. The 12/12/12 Portal: Fact or Fiction? Today is December 12th, 2012, which many members of the metaphysical community consider to be a “portal”. Although I am all in favor of any excuse to celebrate the Magick of this particular time period, I have to say, that as a professional Numerologist (amongst other things), I am perturbed by the inability of people to learn to COUNT. Yes, I’m celebrating a unique date that only happens once ever 100 years, but it has NOTHING to do with “portals”. Remember the date is 2012, not just “12″, and the “2″ continues to be left out of the count, which changes the numerical vibration significantly. Today’s date actually equals “11″, which in itself is a Master Number in Numerology. Of course, there are myriad individuals who are making money by selling this foolishness to the masses, and with the job market as it is, I suppose some people have to make money any way they can. Still, I wish they would stop and learn to count before blathering on about the fabricated mystery of this date. While I’m on the subject, you can see the “magickal result” in the case of various Hollywood stars getting married on other supposed “lucky” dates. Such as Eva Longoria, who decided to get married on “07/07/07″, thinking it was a numerically special day. Again, someone didn’t know how to count, because only 2 years later, she was already divorced! She forgot to add the “2″ in 2012, which made the date equal a “23/5″ number, a horrible number for celebrating a wedding! All that being said, I hope nobody spent too much money channeling the aliens, thinking that it was 12/12/12, as it is actually 12/12/2012! Also, remember that nobody REALLY knows the true date in our Cosmos, as Calendar dates (even those of the brilliant Mayans) are constructs of man and his limited understanding of Time itself. What the Mayans celebrated were actual planetary alignments (of which today’s are minimal at best, despite a couple of planets moving into new signs). The only “real” portal that we will be experiencing soon, is tomorrow’s New Moon in Sagittarius, the final New Moon before the Winter Solstice of 2012. For now, it would make me happy if all the readers of this post would simply learn to count, and stop fabricating/publicizing “portals” that only exist on paper, because of the mere juxtaposition of tripled numbers on a calendar. Yes, there is magick in all of life, which I appreciate as a sentient being, but after seeing this gibberish all over the web, as a Numerologist I simply had to say something, once and for all. I’ll be writing about the 12/21/2012 energies again soon, so keep posted. In the meantime, feel free to learn how to “count” using Western Numerology by taking a class! Marriage on 7-7-07: Lucky or Not? A lot of people have been clamoring over the fact that today is a “magickal day”. 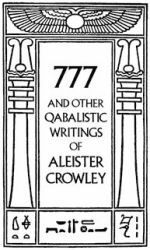 I agree merely for the fact that the date mirrors the title of one of my favorite books by Aleister Crowley — Liber 777. Other than that, today’s date only comes around once every new century, so yeah … I can agree on those points. Chinese Astrology & 777: According to Chinese Astrology, the current Year of the Golden Pig is considered an especially fortuitous time to have children, just as 2006 (the Year of the Rooster) was considered a lucky time to get married. Astrological Aspects for 7-7-07: Despite all the hoopla surrounding various celebrities (such as Eva Longoria) taking the marital plunge today, I sincerely believe today is NOT a good day to get married, nor take any major risks of any kind. Here are a few Astrological reasons that will explain why I feel this way. In fact, even announcing your engagement is a bad idea during this aspect (hear that Nelly Furtado?) Anyway, it’s not my wish to disparage anyone’s happiness, far from it. I just wish people would pay more attention to the flow of celestial energies. It would make life so much better for everyone concerned. 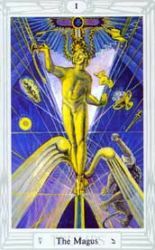 Astrological Aspects of 7-7-07: Read the whole article of Astrological Aspects of 7-7-07, and their influences on today’s date, at the Voxx Magickal Forum: Astrology Section. 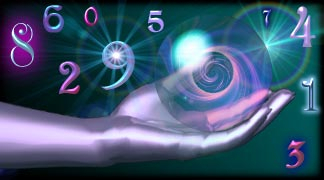 Numerological Aspects of 7-7-07: Read the whole article of Numerological Aspects of 7-7-07, and their influences on today’s date, at the Voxx Magickal Forum: Numerology Section. The New Year 2007 equals a 9 and will therefore, will be an important cycle for most people to pay attention to, especially if you are born under the influence of the Number 1 or 2 (which will be explained below). Here’s a handy guideline of what energies you will be dealing with most during the upcoming year. Don’t know what your Number is? Find out by contacting Voxx for more info on the fascinating subject of Numerology. You can also find out more by joining the Voxx Magickal Forum. Number 9 years are particularly interesting as adding that number to any number from 1 through 9 winds up equaling the same number. For example, if you’re a Number 1 Path, and you add 9, you get 10 (which reduces back down to the number 1 again!) Therefore, all of us will tend to really be in our own element this year; that is, except for those born under the influence of Number 2. 2’s will experience an 11 year, which will certainly prove to be a high point in their lives. Check here for more on Keywords of the Numbers and Planets. To find out what kind of year is in store for you, keep reading!